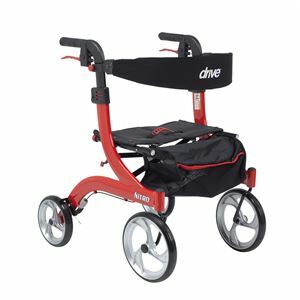 Nitro Aluminium Rollator (Hemi Height),Nitro Rollator in aluminium frame with 10" casters for better and safe mobility. A top seller hemi height rollator is for short people. It is 2 inches shorter than regular walker. Hemi - Handle Height 28"- 31"
I have bought this rollator for my mom who has always used a walker before. This is a perfect upgrade for her in a perfect size. The hemi size is made specially for short people. My mom is little short in height so this rollator is apt for her. It is a beautifully designed rollator with adjustable back and can also be folded easily for storing it away. The price is great too with free shipping. Delivery time frame is good and it is easy to order the product. i will definitely give 5 stars for their service and staff. I loved the service and the product. A great design with easily adjustable handle height. I am impressed by the speed of delivery and the ease of ordering.